CLEMENTE!!! 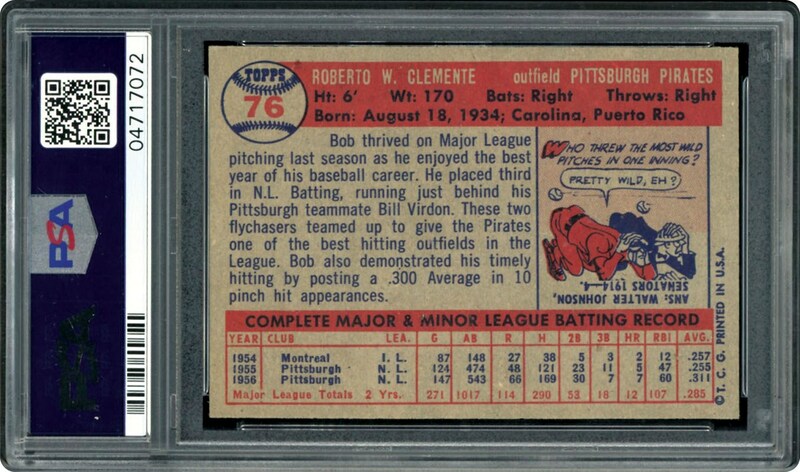 Imagine that PSA has encapsulated over 4,400 Roberto Clemente 1957 Topps cards with only a SINGLE recorded PSA Gem Mint 10 copy! 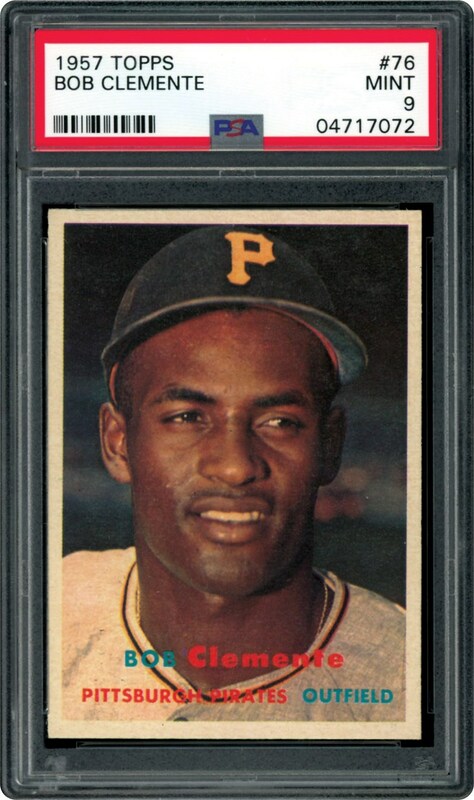 Miraculous as it may seem, that is indeed the case with this breathtaking 1957 Clemente PSA Mint 9 offering sharing the spotlight as one of the finest specimens of its kind! Indeed, roughly 1% of the total PSA graded examples have achieved the hallowed "Mint 9" assessment. It is certainly not an overstatement to claim that legendary Hall of Fame right fielder Roberto Clemente is worshiped by the Hispanic baseball community at a similar level that Jackie Robinson was to all African Americans. In fact, both their iconic legacies extend far past their racial heritage since both players were two of the greatest performers in Major League baseball history. Clemente's accomplishments are seemingly endless, including a .317 lifetime batting average, 3,000 career hits, the 1966 regular season MVP award, four batting titles, 12 consecutive gold glove awards, and if that isn't enough, in 1971 he won the World Series MVP when he virtually single handedly dominated the Baltimore Orioles in both the batter's box and right field. Yet, as is the case with the immortal Lou Gehrig, he will best be remembered for his tragic death when, after the 1972 season, his plane crashed carrying supplies to assist earthquake victims in Nicaragua. The hallowed "Mint 9" grade is justified by Clemente's "spine-tingling" image resolution, pristine colored hues, blinding white borders, razor sharp corner tips and near-perfect centering. If you are seeking a virtually flawless cardboard representation of this baseball icon to augment your collection, then this magnificent 1957 Topps Clemente keepsake anxiously awaits a special place in your world-class gathering!